With completion nearing, at 3PM on the 13th of September, the Aquarius Barrier installation at Lennox Head was abandoned. What was meant to be a three week installation program had taken eight weeks. This was the most devastating outcome of a project that I have encountered in my 35 years of industrial design. When commiserating with me, one of my clients asked me, why on earth are you doing this? You are a successful industrial designer, taking on the forces of nature in an environment that is so volatile and unpredictable, do you really need this now in your life? This got me reflecting and made me question whether, if I had the opportunity to choose to do it again, knowing now what I didn’t know then, would I still do it? Would I put my family and life on hold to challenge this environmental issue? The answer is yes, without a doubt. I am an environmentalist who believes that every creature on this earth has a right to life. I believe that the human effect on the environment is our responsibility and that it would be irresponsible to look away from an environmental issue that I have been blessed with an ability to solve. It is my ambition to cease shark culling practices in Australia by creating a viable, environmentally friendly alternative that will allow us to live in harmony with our environment. From here there are two paths we can take. We can bury our head in the sand and continue with the shark culling methods that our nation has grown accustomed to. Or we can recognise the incredible opportunity we have to find an effective solution that will provide peace of mind for our families and children, so that they can swim in the ocean and co-exist with its rich marine life. The trial of the Aquarius Barrier at Seven Mile Beach, Lennox Head has established the foundations for further development of the technology, and giving up after this first trial in a high energy environment would be counterproductive. Seven Mile Beach at Lennox Head is a beautiful, ever changing coastline that is seldom gentle, mostly energetic and sometimes extremely powerful. Placing an enclosure in this pristine part of Northern NSW was first discussed in April 2015 and has resulted in months of collaboration, design and engineering with experts in various fields. The aim of this trial was to uncover a wealth of information that would help establish the design, installation and environmental criteria for future barriers, not just in NSW but around the world. We thank and take our hat off to the Department of Primary Industries and the NSW Government for taking the initiative and supporting such a challenging environmental issue and for trialling this one of a number of ground breaking technologies. 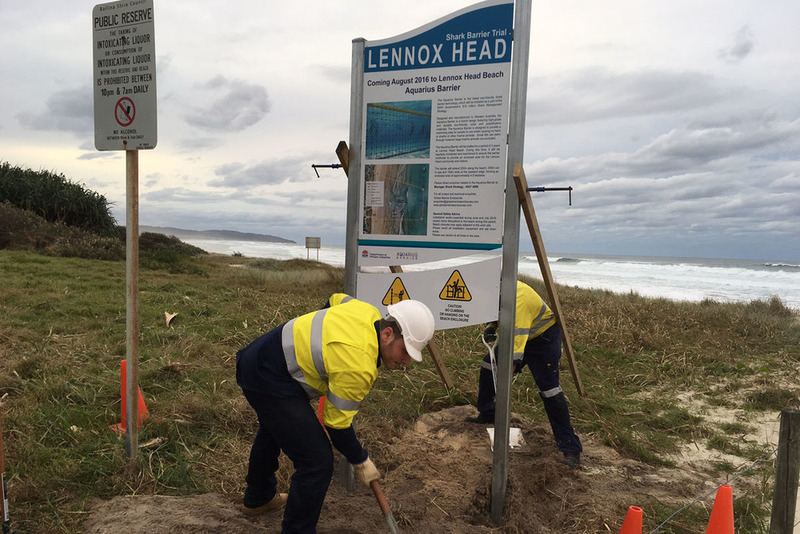 We apologize to the Lennox Head community for the disruptions to the beach during the attempted installation and thank them wholeheartedly for their encouragement and support throughout the project. We are working hard to clean up and return the beach to its original condition. We have already begun working on new design improvements to advance our technology and hopefully we might have another opportunity in the future to provide a safe swimming enclosure at Lennox Head. This is not the end of our journey, it is just the beginning. The Aquarius Barrier at Lennox Head has come closer to completion as work now begins on installing the barrier itself. On Tuesday morning the outer wall (170m long) was pulled out into the ocean and secured to the ground chain by the dive team. The process took most of the day while the divers had to contend with murky water conditions due to disrupted sediment. If weather conditions allow, the Lennox Head shark barrier could be in place as early as this weekend. Most of the installation construction work involved installing the mooring system that holds the shark barrier to the seabed, which has now been fully completed. The team have successfully installed all 21 x 2.4t concrete blocks, 86 x 50kg stingray anchors and 650m of ground chain. Consistently large swells and strong winds have made the installation of the Aquarius Barrier at Lennox Head extremely difficult. To get the project back on schedule, we came up with an innovative and very effective method of installing the concrete blocks: using a helicopter. For the 650m Lennox Head Aquarius Barrier there are 21 concrete blocks to install, each weighing 2.4t. Floating the blocks in the large swell and shallow water proved too difficult, so other options were explored to improve the process. It was decided that using a helicopter to lift the blocks would significantly speed up the installation process. The pilot found the correct GPS location and released each block into the exact position. The helicopter managed to complete the installation of the blocks in under 3 hours, compared to at least 3 days in good weather for installing with the commercial work vessel. There was a very positive feeling in the local Lennox Head community who were pleased with the progress made. Many locals gathered at the beach to watch the excitement of the helicopter at work. Images provided by Craig Parry Photography. 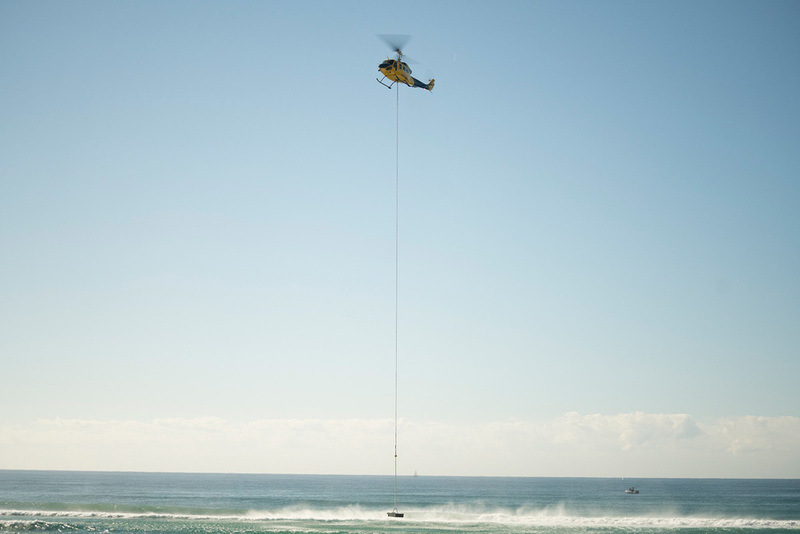 Work has begun on the Aquarius Barrier for Lennox Head after 6 months of diligent planning and preparation. The Aquarius Barrier was selected for trial by the New South Wales Department of Primary Industries in December 2015. Eco-friendly shark barriers have been successfully installed in Western Australia but up until now the technology has not been trialled in large swell surf beaches. The Aquarius Barrier has advanced the technology to a stage where it is suitable for these conditions. The Aquarius Barrier at Lennox Head will be the first eco-friendly barrier in the world to be installed at an exposed surf beach. We are very confident and will monitor the progress closely over the coming weeks and months. Although it is a trial, it is by no means a 'hope for the best' scenario: the entire project and the barrier design is based on extensive knowledge and experience in structural engineering and materials. We have gone to great lengths in research and development to ensure that the barrier is qualified to perform in its environment. We will continue to post updates throughout the installation process and over the course of the trial to inform the public of its performance. The Aquarius Barrier had its third monthly service on the 8th July 2016. The barrier has performed exceptionally well in the winter season conditions. The barrier service included checking all struts, clips and barrier components across the entire length of the barrier. During this service the red floats that identify the two craft access points were upgraded from painted red floats to permanent red material floats. We are also trialling a brand new material for the floats with an exciting feature - this will be announced shortly. The growth on the barrier continues to be monitored. Cleaning was originally scheduled for every three months but the dive team has noticed that the barrier growth is predominantly algal which is very lightweight and does not affect the performance of the barrier. It was noted that cleaning is not required in this time-frame, and may not be required at all.